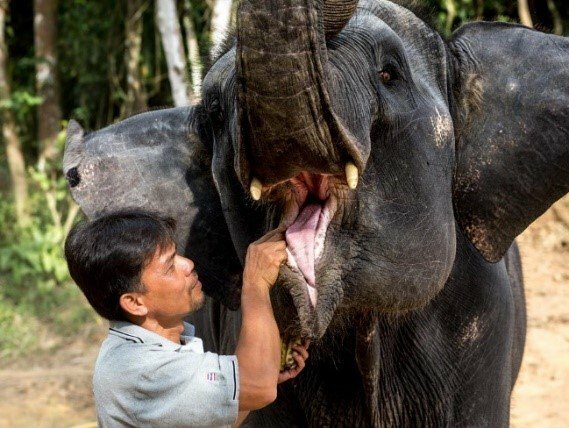 This fascinating article was written by one of the Phang Nga Elephant Park Volunteers, Holly Collicott, following her 3-month placement at the Park in 2018-2019 (please see About the Author at the end of the article). We are very grateful for Holly’s insightful and thoughtful article and note that credit has been given for the photographs used. Disclaimer: Please note that the views expressed in this article are solely those of the author and do not necessarily represent those of Phang Nga Elephant Park or its representatives. Elephants are the national animal of Thailand- they represent strength, loyalty and longevity. Many Thais believe, for example, that walking under one will bring luck. 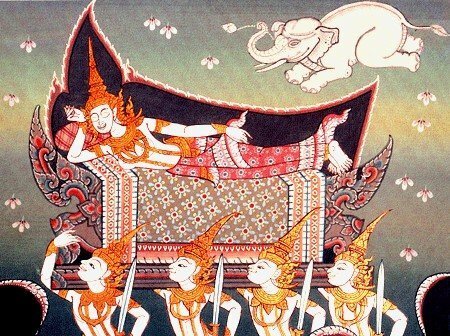 Thai and Buddhist literature about elephants are still the basis of popular stories today. 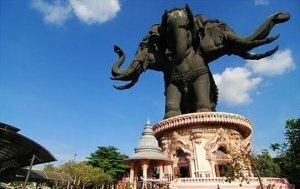 The importance of elephants in Thai culture is rooted in history and religion, but is visible throughout modern Thailand. Elephants are incorporated in art, clothing, adverts and even beer bottles; they have also been used on Siamese coins and an elephant was featured on the national flag until 1917. 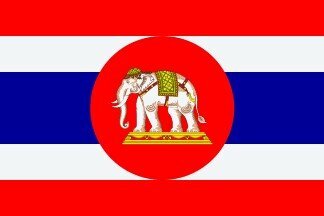 A white elephant is still centred on the Royal Thai Naval ensign, because it represents royalty and power. Use of elephants in Thai architecture dates back hundreds of years and some buildings were specifically designed with elephants in mind. In the Arutthayan period (1351-1767), most bridges were made of wood or cement, but a select few were made of bricks. These were reserved for royalty and designed to support the weight of their elephants. Elephants are also incorporated into artistic designs. Wat Ban Rai in Nakhon Ratchasima Province, for example, was an ancient monastery, rebuilt in 2011 into a temple, with a giant elephant on the roof! Elephants feature in modern urban Thai architecture. 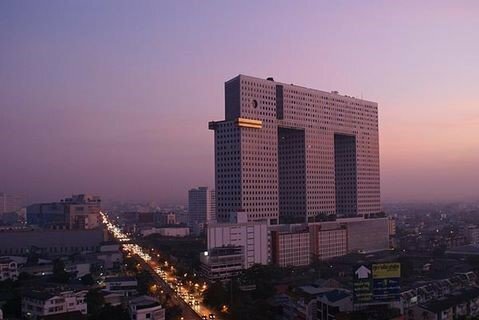 The Elephant Building, built in 1997 in Bangkok, is shaped like a 102 m tall elephant. Bangkok is also home to the Erawan Museum of cultural artefacts- on its roof is a giant three-headed bronze elephant. Elephants have long been associated with the Thai Royal Family. Since ancient times, the number of elephants owned by a ruler has symbolised their status. In 1861, King Mongkut learned that the American President, Abraham Lincoln, had no elephants and found this so astonishing that he wrote and offered to send some, but Lincoln declined. The rare, so-called ‘white elephant’ is termed ‘chaang samkhan’ in Thai (meaning auspicious elephant). White elephants are not ‘white’ in the true sense, and are classified using an ancient grading system. All white elephants in Thailand are the legal property of the reigning monarch. There are currently believed to be 10 white elephants in Thailand, all owned by the King. The number of white elephants owned represents a monarch’s majesty, power and fortune. At one time, His Majesty, The late King Bhumibol owned 21 white elephants – an unparalleled achievement. White elephants are not allowed to work, or breed, so in the past they were wild caught. They are so few and so sacred, they are only viewed by the public on very rare occasions and have been used in royal ceremonies for hundreds of years. The King’s white elephants used to live in Chitralada Palace in Bangkok, but are now at the Thai Elephant Conservation Centre, Lampang, where they have been for over 30 years. White elephants are also used in royal emblems. 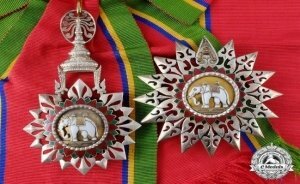 The Order of the White Elephant is the highest honour awarded by the monarch for service and bravery. 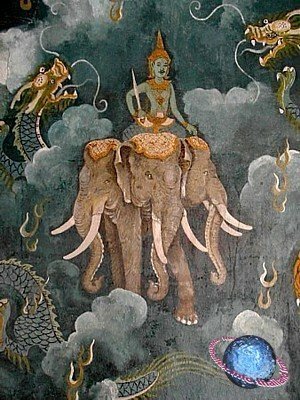 In Buddhism, the main religion of Thailand, elephants are guardians of Buddha, Earth and its temples. Their physical strength represents mental strength and responsibility. In ancient times, Buddhists supposedly noticed how elephants show thoughtful behaviour, intelligence and an ability to be trained. This led to their association with the enlightened Buddha, whose teachings founded Buddhism. The Buddha is said to be reincarnated from elephants, so they are one of ten animals which Buddhists must not eat. White elephants are worshipped as holy animals in Thailand. They symbolise purity and are believed to be descended from heaven. Buddha’s mother, Queen Maya, was said to dream of a white elephant before becoming pregnant with Buddha, over 2500 years ago. White elephants are said to have enabled her pregnancy, and so represent fertility. Because they brought Buddha from heaven, he was destined to be a powerful leader. White elephants are associated with the Buddhist and Hindu god, Indra. He has a flying white elephant, called ‘Erawan’ in Thai, with 33 heads (but usually shown with 3). Indra and Erawan are thought to control the weather, so many believe that elephants can bring blessings of rain and good fortune. 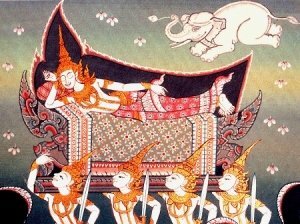 Erawan is said to carry Indra from Heaven to Earth, to bring fortune and battle demons to protect Earth. Elephants were domesticated in Thailand for use in warfare, transport, farming and construction for centuries. They remain a symbol of power and status today. As mentioned above, they are still used in traditional and religious ceremonies, and on special occasions. Thai records about the use of elephants in combat date back to the late 1200s, under King Ram Kamhaeng. Duelling on elephants was a ritual reserved for rulers and high-ranking people. The monarch would ride at the front to fight and the elephant’s kwan-chaang (a Thai elephant carer, also known by the Hindu word mahout) would be at the back, directing the elephant. There were many such duels in the 1500s, which were often used to settle political disputes. 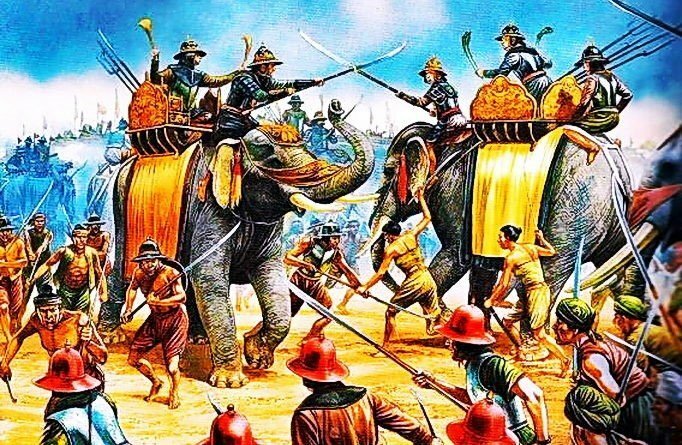 A male elephant in musth was allegedly used by King Naresuan in 1593 to defeat the Burmese prince, Mingyi Swa, ending the Burmese invasion of Siam. Another documented version of events is that in battle, the King held some reserve elephants in the forest and feigned retreat. The Burmese army followed, were surprised by the King’s army and were roundly defeated. Elephants were used in warfare, much as horses were in the West. The power of rulers was measured by the number of elephants they had on the battlefield (often numbering tens of thousands). Those with more elephants were usually the victors. Victorious elephants were often awarded noble titles, along with the soldiers. Extensive use of elephants in combat (often males in musth, when they become aggressive) continued until the late 1500s. When modern firearms and canons were invented, it was clear that someone riding an elephant became an obvious target but the use of elephants in combat continued nevertheless until the early 1800s. Around this time, the first roads in Bangkok were made from old elephant tracks. Tens of thousands of elephants were then used for transportation into the 1900s, until alternative methods were developed. The elephant’s ability to drag several thousand kilograms led to their use in logging – clearing logs from the thick jungle. This was their main use by the late 1800s. 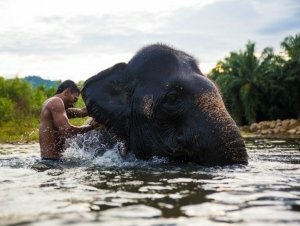 It’s estimated that there were 100,000 logging elephants in Thailand 100 years ago (it is estimated that Thailand now has only around 3000 domesticated elephants). Logging elephants were often taken from the wild at 3-5 years old, and would first be taught commands such as to crouch down, stand up, pick up and stop. They would also learn to know and trust their kwan-chaang. Over the next 5-6 years into adulthood, they would learn to lift logs, drag them to the rivers and pile them, ready to be taken for manufacture in Bangkok. Some logging camps gave their elephants enough health checks, rest, food and water, with free roaming time in the hottest months. Others overworked their elephants, shortening their lives from the expected 70-80 years in captivity. The Thai government banned private logging in 1989 to protect the forests and timber. Logging is still permitted in some southern areas, but only on government authority, and is illegal in protected areas, where wild elephants remain. Although vital to conserve the remaining forest and wild elephants, the 1989 ban left several thousand logging elephants (70% of Thailand’s domesticated elephants) unemployed. Of course, owners still had to financially support their elephants, and feed them (up to 250-300 kg of plants every day). As a result, many owners took their elephants to Myanmar, where logging was still legal, and others turned to illegal logging, where the elephants were often made to work faster and excessively often to the detriment of their health. Some owners took their elephants to Bangkok, where they endeavoured to earn money by getting the elephants to perform circus tricks or simply to beg from the tourists. 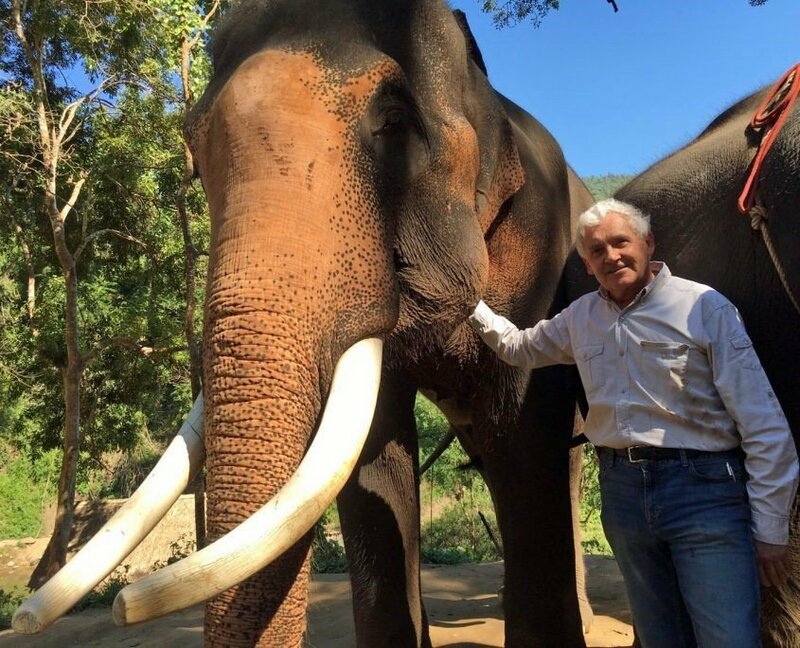 Hot concrete, polluted air and water, and poor food often created pitiful conditions for the elephants, but was sometimes the only way a kwan-chaang could get employment and afford to feed his elephant. There were few legal alternative jobs available at the time with enough pay. In 1997, bringing elephants into Bangkok was banned, punishable by fines and confiscation of the elephant. However, there are still thought to be over 100 elephants working illegally in Bangkok obtaining money both from tourists and from Thai people who believe that in supporting the elephant they will get good luck. Since 2010, it has been illegal for people to feed city elephants or support this practice in Bangkok, punishable by arrest and fines. From 1984 to 1989, the number of tourists visiting Thailand increased from 2.3 million to 4.8 million per year and the trend continued in the following years. The booming industry provided employment opportunities, but a lack of infrastructure or regulations led to exploitation of elephants that increasingly were found performing at tourist attractions, or at tourist camps, often tethered with little or no chance to socialise or exercise freedoms. The kwan-chaangs were underpaid – they had nearly all of their income taken by their employers, or they had to rely on tips alone to survive – which sometimes resulted in elephants being overworked and getting inadequate feed. Food alone for an elephant can cost over $70 a day and kwan-chaangs often had to share ownership of one elephant, meaning the elephant was further overworked in order to support two or three families. There has been a recent movement to use tourism for sustainable, ethical employment for kwan-chaangs and domesticated elephants. It must be recognised that domesticated elephants are too dependent on human care to be released into the wild, but we can return them to a natural habitat. The money from ecotourism provides them with a safe home, good husbandry, medical care and a proper diet, while supporting kwan-chaangs and their families. Performing elephants still do exist in Thailand, but tourists are increasingly aware of animal welfare, so ethical tourism is rapidly becoming more popular. By supporting ethical tourism, tourists can help end the poor welfare issues surrounding domesticated elephants. Although some attractions are run for profit and not for the benefit of elephants, most people who commit their lives to working with elephants do so with good intentions. Many want to provide a safe and positive environment for the elephants, but do not have the funds to do so. Food, care and housing for a 4-6 ton elephant costs at least $1000 per month. Elephants cannot be ‘rescued’ in Thailand, as they are classed as ‘working animals’ under the Beast of Burden Act 1939. This makes them private property of their owners, so they must be bought or rented. An elephant in peak condition might cost $100,000 to buy. There is also a lack of education about appropriate care. Centres such as Phang Nga Elephant Park aim to be a role model for those who work with elephants to learn from and copy, with a view to to helping improve elephant welfare across Thailand. The term ‘unemployed’ elephants can lead people to conflate them with unemployed humans. They associate their employment with welfare, but this isn’t always the case. Standards of a human workplace should also not be applied to elephants, or vice versa, to avoid humanising the needs of elephants and dehumanising the needs of kwan-chaangs. Domesticated elephants remain important to the Thai economy. With numbers at about 3000, Thailand has a high population of domesticated elephants, second only to Myanmar and with a similar number to India. Compared to other Asian countries, a very high proportion of Thailand’s elephants are domesticated – there are only about 2-3000 remaining in the wild. One hundred years ago, there were 100,000 domesticated elephants in Thailand and a similar number in the wild. Tourism camps are therefore as important to protect them, as they are to the economy. Kwan-chaangs (elephant carers) once had a very respected, honourable profession, originating from their role in historic battles. Traditionally, kwan-chaangs would live closely with their elephants, in their elephants’ natural habitat. They would know how to make best use of the forest to keep their elephant healthy. The role would be passed down by a father, who would train his son. Often from as young as 6, a kwan-chaang would develop his skills and understanding of his particular elephant. Both the kwan-chaang and his elephant would often come together in their youth and be together for life. It takes years to build a trusting, cooperative relationship, where the elephant responds to their kwan-chaang’s voice. Once a kwan-chaang knows his elephant, he can read their body language and predict how they will move. He can see if something is wrong with their health or mood. This traditional lifestyle is still practised in some hill tribes in remoter regions of Thailand. This practice could not meet the increasing demand for elephants in the rapidly growing tourism industry. To make matters worse, many owners were selling their elephants and not passing on their skills to their sons, who often preferred the wages and lifestyle of city jobs. Elephant camp workers sometimes only have a few days’ training and many are low-status immigrants from Myanmar. This has been a common practice used by tourism camps to get cheap labour. Employers have little commitment to protect their employees, who, if they are illegal immigrants, have no legal right to training, safe conditions or proper pay. Although the tourism industry has increased awareness of elephants’ welfare, it has decreased recognition of the people working alongside them. Workers are often forced into poor conditions, while caring for their elephants 24 hours a day. Due to low pay, they have no long-term commitment to the job. In such poor centres, the so-called carers are rarely paired 1-1 with elephants and develop little or no bond with them. This situation often results in the elephant not having a relationship with its carer, failing to cooperate fully, and as a result the attendant becomes fearful of his charges and unable to control it. This can lead to animal abuse and accidents. Mistreated or overworked elephants, as with other animals, can develop mental disturbances and may act unpredictably and even dangerously. Men at these sites may be called ‘kwan-chaangs’ or ‘mahouts’, but are not worthy of this respected title and their inadequacies lead to negative and inaccurate views of genuine kwan-chaangs. Being a true kwan-chaang is about more than feeding and cleaning up after elephants. Kwan-chaangs know that fearful, reactive abuse does not control an elephant, whereas proactive communication and a strong bond, based on mutual respect, and dedication do. A kwan-chaang is like a matriarch elephant, and usually think of their elephant as their family; this is important to the elephant too, since a captive female may lack the herd protection they would have in the wild. A proper kwan-chaang will live and work alongside his elephant. Every day, he will check their health and ensure they get several cooling bathes, about 200 L of good water to drink and 250-300 kg of food. (For a instructive short video about the life of a kwan-chaang click here). It is not in a kwan-chaang’s interest to harm his elephant, which is his source of income! Abuse usually results from poor training and inadequate understanding, which centres like Phang Nga Elephant Park are trying to change by upholding the traditional practice of pairing elephants 1-1 with kwan-chaangs. We base this on both of their personalities, to secure the most trusting and cooperative relationships possible. Elephants need several baths a day to keep cool and scrubbing them keeps their skin healthy. A kwan-chaang should have a close bond with his elephant. In 1921, King Vajiravudh decreed that wild elephants were owned by the state. Because of their cultural and economic value, hunting for sport became punishable by fines, or a prison sentence of up to 3 years. Asian elephants have also been protected internationally. Because of their endangered status, they were added to Appendix I of the CITES treaty in 1975 (Thailand joined CITES in 1983). However, due to their importance in the Thai economy, they are still classed as ‘working animals’ under the Beast of Burden Act 1939 which states that domesticated elephants are private property and can be used and traded at will. Beasts of Burden are at present excluded from national animal welfare and protection regulations. 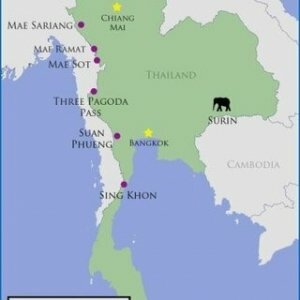 The Wildlife Reservation and Protection Act 1992 (WRPA) was set up by the Thai government to conserve wild animal populations. It prohibits hunting, capture and trade of wild elephants and their products. The government set up a Committee of Wild Animal Reservation to enforce the Act, and to inspect and maintain wild elephant reserves. International trade in wild elephants and their products has been banned by CITES, since they are under Appendix I, but WRPA helped tackle trade within Thailand. However, as ‘Beasts of Burden’, domesticated elephants and their products can legally be traded within Thailand. Also, conservation efforts of the Royal Forestry Department (and the rest of the Committee of Wild Animal Reservation) cannot target domesticated elephants. If they were listed under WRPA, prospective owners could also be screened before obtaining elephants. Under the Beast of Burden Act, anyone who can register to own working animals, regardless of expertise, may keep an elephant. In 2002, the government Department of National Parks, Wildlife and Plant Conservation (DNP) was formed and given responsibility to manage and implement WRPA. Capturing or killing a wild elephant is punishable by fines, or up to 4 years in prison. 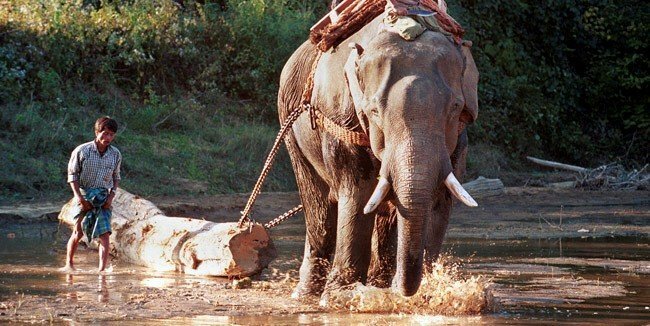 Licences for wild elephant capture have not been released in Thailand since the 1970s and illegal capture is now very rare, since populations are in protected National Parks. Illegal live exports from Myanmar are also rare. In February 2012, the Thai government increased security and law enforcement measures, to verify the identity and origin of captive elephants and enforce WRPA. Research of tourism camps by the wildlife trade monitoring network TRAFFIC showed the number of elephant confiscations by the DNP in 2012 was 100 times that in 2011 and this number remained high in subsequent years. Surveys showed that the number of illegally caught wild elephants observed at these sites reduced over this time frame and trade suddenly halted at hotspots on the Myanmar border. The Beast of Burden Act 1939 stipulated that working animals must be registered with the Local Administration Department by 8 years of age, when each would get an ID card. Relocations must be reported and elephants without ID can be confiscated. In 2016, this was reduced to 90 days old. This virtually removes the window where illegally caught wild elephants could be passed off as ‘captive’. Since 2015, domesticated elephants must also be DNA registered with the government. The Beast of Burden Act has been amended so ID cards must include photos and tusk information, microchip code and DNA code. Although there is a risk that microchips can be swapped and documents faked, the DNA system guarantees the identity of an elephant. In future generations, it will also verify on registration that an elephant is descended from domesticated parents. 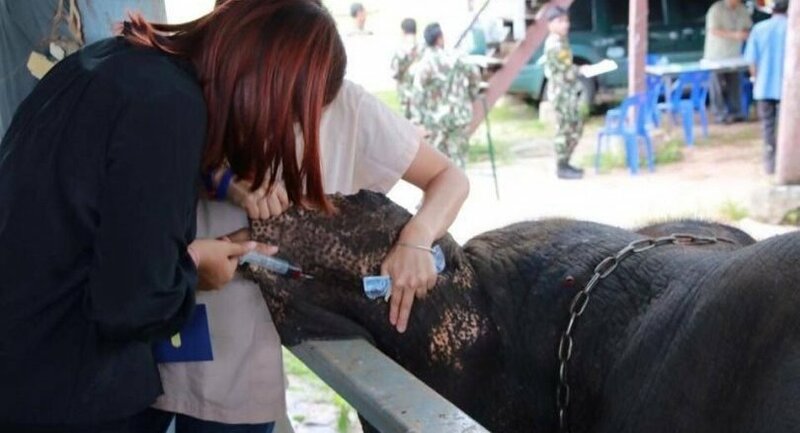 The DNA tests are done by veterinarians in Thai government departments, the DNP and the Department of Livestock Development (DLD), and handed to the Department of Provincial Administration, who update the national database. Over 3440 domesticated elephants (>99% of the documented Thai elephant population), are now DNA registered. This system prevents wild elephants from being smuggled into the tourism industry. It also gives a more accurate figure for the captive elephant population and will help monitor their movements. 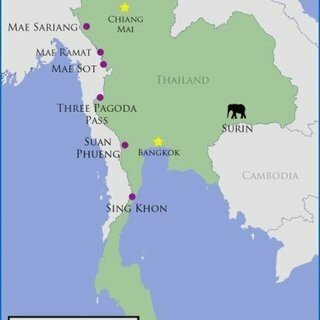 Prior hotspots for wild elephant smuggling at the Burmese border. A government clampdown in 2012 helped stop this. The number of ivory products being sold in Thailand is a fraction of its former market, since the 1992 ban on wild elephant ivory trade. 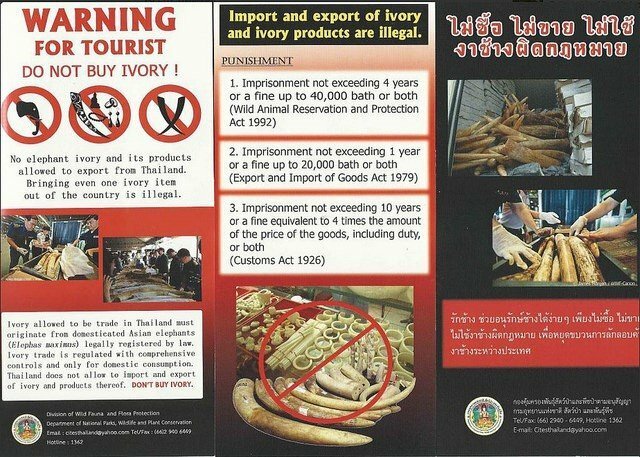 To abide by WRPA, ivory must only be sold alongside acquisition documents, to prove its origin. 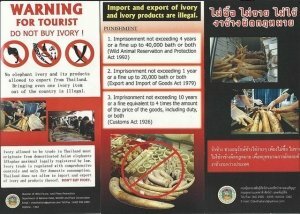 Thailand implemented a National Ivory Action Plan in 2014, which became the Elephant Ivory Act in 2015. This Act more tightly regulates the trade, import and export of domesticated elephant ivory. To possess ivory legally, the acquisition documents must now be presented to the Department of National Parks, Wildlife and Plant Conservation (DNP). The DNP verifies that the ivory comes from an approved dealer, registers the new owner and issues a certificate of possession for the item. If the owner cannot provide the certificate on the DNP’s request, the ivory is seized. The new DNA database for domesticated elephants should mean that this documentation can no longer be faked and supplied with wild elephant ivory, which can be DNA tested. The Elephant Ivory Act also states that changes of ownership, location or transformation must be reported, or the resulting fine is up to 3,000,000 baht (£72,000; $85,000). If traded, exported or imported without permission, the penalty is up to 3 years’ imprisonment, or a fine of up to 6,000,000 baht (£144,000; $170,000). The Department of Livestock Development (DLD) manages and enforces the welfare of working animals, like domesticated elephants. The Animal Epidemics Act of 1956 compels owners to obtain permission from the DLD before moving an elephant across Provinces, trading elephants or their products. The DLD ensures the safe movement, health and welfare of captive animals via their veterinary networks. The DLD has set up mobile veterinary teams, specifically for elephants. In 1997, CITES mandated that there were two systems to monitor illegal elephant hunting and product trade. Monitoring the Illegal Killing of Elephants (MIKE) is used to map carcass findings and track populations and mortality rates. Local authorities and NGOs in Thailand collect the data. The Elephant Trade Information System (ETIS) is used to track illegal trade in elephant products, using seizure records. These systems have been checked regularly since their setup and help direct protective measures and management efforts. A government database was set up in 2015, to record all legal ivory possession, approved traders, stocks and trade. Illegal ivory seizures are also logged, to help direct investigations. Ten government agencies and Thai police make up a subcommittee for Ivory Law Enforcement. Hundreds of inspections are carried out each year, by 79 patrol teams. Inspection checkpoints exist across the country and 11 special task forces were set up for trade intelligence in high-risk areas. Airport security is heightened, with the aid of new detection technologies. There are 100% inspections for high-risk routes. Seized ivory has been incinerated since 2015, to comply with CITES regulations and prevent leakage into markets. In 2015, 20 organisations were made responsible for increasing public awareness of ivory trade laws. 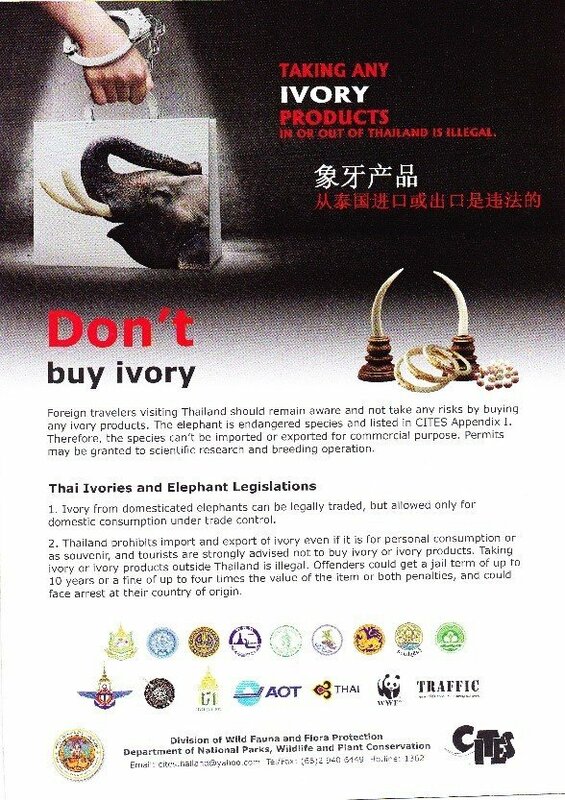 Campaigns by Thai authorities informed tourists about the ban on exporting ivory. Their efforts targeted airports and attractions, but were enforced by the Tourism Authority of Thailand in offices worldwide. Tens of thousands of media broadcasts have also informed local people about the laws of ivory trading. Thanks to increased awareness, many people contact information centres for controlling ivory trade each year and have registered the ivory they possess. Security and campaign efforts are reinforced by a National Committee on CITES, split into subcommittees for regulations, registration, law enforcement and public awareness. They meet regularly throughout the year. Efforts to reduce trading are showing signs of success. Research by TRAFFIC in 2016 showed a 96% reduction of ivory on sale in Bangkok markets, since 2012. 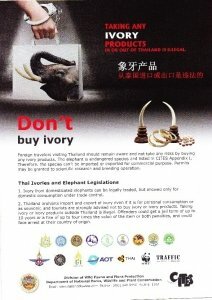 Posters warn Chinese and English speaking tourists and Thai people of the laws and penalties regarding the ivory trade. Many include the logos of organisations backing this. Since 2004, Thailand has been a leading country in engaging CITES authorities with ASEAN (the Association of South East Asian Nations), to make a regional network to combat illegal trade of wild species. This led to the Wildlife Enforcement Network (ASEAN-WEN) being formed in 2005, by CITES officials, immigration services, customs and police. It enormously helps countries to share data on cross-border trafficking and best practices to prevent this. The Department of National Parks, Wildlife and Plant Conservation (DNP) has been transporting wild elephants to protected forested areas and building food sources for them. National Parks are being developed, where people can visit wild elephants in a natural environment. In the last decade, the DNP has worked with charities and social clubs in Thailand to increase the frequency of wild elephant counts, engaging the public. In March 2017, the DNP recorded that the population of wild elephants in protected areas had increased by 10%. The wild population of elephants in Thailand is reportedly increasing by 7% per year. Feeding the exponentially growing Thai population calls for more farmland. 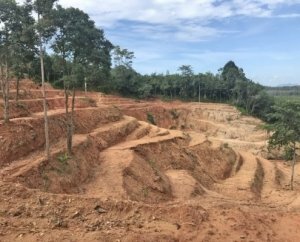 Environmental and Forestry groups, and the Thai Royal Family, are working to protect the remaining forest. 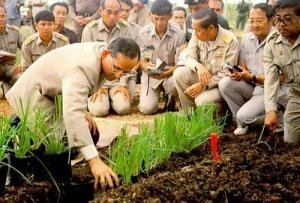 His Majesty The late King Bhumibol encouraged mountainside farmers to plant Vetiver grass, which acts as a barrier against flood damage and slows water flow to prevent land drying, keeps fields in use for crops and avoids further conversion of forest to farmland. His Majesty The King also campaigned to reduce global warming. His actions helped protect the remaining habitat for elephants. Elephant conservation charities, such as the Southern Thailand Elephant Foundation (STEF) promote the use of sustainable agriculture, by growing elephant food on converted land that was used for rubber and palm oil plantations. The increasing number of plantations has caused conflict between people and elephants. Wild elephants stray onto farmland to feed, since their habitat is so fragmented and they must roam about 6 km2 a day for food. This frustrates farmers, who can kill the elephants to protect their crops. Hundreds of elephants were killed from the 1900s to the 1980s, as a result. The Thailand Research Fund began funding research into solutions for this human-elephant conflict over 20 years ago and in 2003, collaborated with Wildlife Fund Thailand to monitor and profile elephants that strayed outside the forest. However, conflict still resulted in 107 human and wild elephant casualties and deaths from 2012-2018. This included deaths of at least 25 wild elephants, nearly all of which were due to high voltage electric fences. With the development of new technologies, it became easier to monitor wild elephants and assess what worked to reduce conflict. Surveillance systems and safe low voltage fences are becoming more popular, to prevent disturbances. More recently, the government has introduced trenches to prevent elephants from trying to access crops. Farmers also plant trees, as a barrier. These are now common and successful measures. Environmental workers and corporate sponsors have also introduced salt licks to forested areas, to lure wild elephants away from farms. The DNP and park rangers have announced plans to introduce more alternative elephant food sources and more buffer zones between elephants and human settlements. The DNP also plan to reimburse farmers who have lost their crops due to elephants. The role of elephants in Thai culture is still at risk; they are seen by some as a nuisance, not the symbolic icon they once were. His Majesty The late King Bhumibol encouraged hill tribe farmers to plant Vetiver grass, to protect the farmland. This prevented further conversion of forest into farmland. At Southern Thailand Elephant Foundation (STEF), land previously used for plantations had to be converted to terracing, to grow elephant food, like bamboo and elephant grass. Many domesticated elephant camps in Thailand educate local people and tourists about the challenges facing wild elephants, and ways to help. This not only supports wild elephants, it also builds understanding between people. Some want to preserve the role of domesticated elephants in their culture, while others are more concerned with increasing wild populations. By aligning our goals, the situation for elephants overall is more likely to be improved, than by furthering conflicts of interest. In this spirit, in 1998, the Prime Minister’s Committee for Elephant Protection chose 13th March to be Thailand’s National Elephant Day. The annual campaign helps preserve the important role of elephants in Thai culture and religion. It also increases public participation in their protection, by providing fundraising opportunities for conservation and tourism centres alike. Another government initiative has been to train city kwan-chaangs as forest rangers. This returns them and their elephants to nature, while providing a future for both. The work also helps protect wild elephants and their habitat. National Parks now have armed rangers – many have been injured or killed by poachers, while defending elephants. In 2002, the Department of Livestock Development released guidelines for elephant camps, to improve standards of factors like housing and food. The main reason that these are not always enforced is a lack of funding. In 2015, the ASEAN Captive Elephant Working Group was formed of about 40 elephant specialists, veterinarians, researchers and conservationists. They have released a set of goals to realistically transform the tourism industry. This includes a certification system for tourism parks, which would also ensure that kwan-chaangs and elephants are adequately trained. 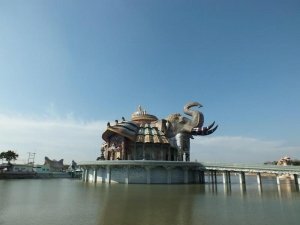 The Thai government is currently implementing laws that will mean kwan-chaangs need a licence and that elephant park owners need a permit from the DNP, that must be renewed every 3 years with inspections. 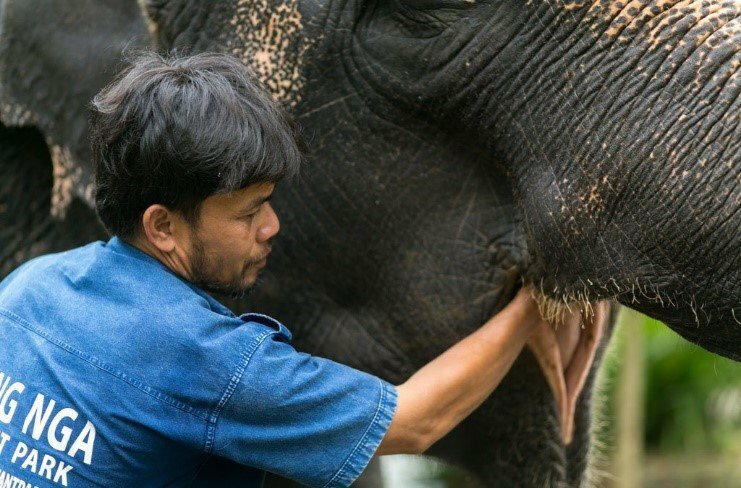 Her Majesty Queen Sirikit and the Forest Industry Organisation have set up a mobile veterinary project to provide check-ups and treatments to elephants across Thailand. Non-Governmental Organisations are also being used to care for domesticated elephants and many use funding from international organisations to provide mobile veterinary services, using voluntary workers. They include ‘Friends of the Asian Elephant’, which set up the first elephant hospital. Most NGOs are based in the north of Thailand, so it was important to set up STEF, to provide free treatment for elephants in the south. This enables keepers to take better care of their elephants. Increased tourist awareness about elephant welfare has also encouraged higher standards of care. The focus is now on preventing health problems, instead of reactive treatment. It is commonplace in ethical parks for kwan-chaangs to check their elephants’ basic health every day, in addition to regular veterinary check-ups. As more domesticated elephants from the logging days reach old age, retirement centres like STEF are being set up to care for them. Another focus at STEF is developing the skills of kwan-chaangs. More children now go to school and fewer train to be kwan-chaangs. This is worrying, as elephant workers without expertise are likely to resort to instinctive, reactive methods, risking human safety and elephant welfare. STEF aims to teach children about modern, ethical methods of elephant care and the best environments for elephants. They also aim to show how to use breeding to ensure elephant conservation. A kwan-chaang should check his elephant’s health daily. Dr Andrew Higgins is one of our veterinary advisers and has been involved with Phang Nga Elephant Park since its inception. He also is Chairman of STEF. Many believe that domesticated elephants should be removed from the Beast of Burden Act and placed under the Wildlife Reservation and Protection Act (WRPA). Alternatively, the Royal Forestry Department could be placed as competent officials in the Beast of Burden Act, so they can better manage the conditions for domesticated elephants. Another solution could be to make a special law for elephants. Although endangered and under CITES Appendix I, most of the Thai population of elephants are working animals. Having spent thousands of years dependent on humans, they cannot be considered ‘wild’. It would also be hard to apply the WRPA restrictions on breeding, selling and moving to domesticated elephants. It would only increase financial difficulties for their owners, worsening conditions for the elephants. WRPA also lacks definition of harmful acts towards domesticated animals. But domesticated elephants need standard care regulations and neither the Beast of Burden act, nor WRPA, is readily adaptable to their unique case. A special law regarding working hours, feeding, housing and care for domesticated elephants would be beneficial. The Tourism Authority of Thailand could financially endorse elephant parks that are assessed to have high welfare standards. This would encourage other parks to raise their standards. Schools should incorporate elephant care training. Children are often leaving their families’ tradition of keeping elephants, aiming for jobs with more pay. Teaching them the importance of kwan-chaangs in Thailand and modern methods of ethical care is vital. Improving the working conditions, salary and status of kwan-chaangs would encourage more to train. Upholding the 1-1 partnership with elephants increases safety and welfare for both. Elephants should be effectively banned from the cities and more suitable careers provided for kwan-chaangs. Elephant owners should be educated to increase their trust in modern veterinary medicine and replace more traditional methods. But there is a need for more veterinarians specialised in elephant medicine and surgery. Programmes for elephant-specific training could be set up for veterinarians working in the Livestock Department and the Royal Forestry Department. Standard methods and equipment cannot be used on such big animals and many Thai veterinarians lack the expertise to treat elephant-specific problems. The salary of government veterinarians should also be increased; there is a current shortage of them because private practices offer far higher salaries. Many people want to ban trade of domesticated elephant products. This should, in theory, abolish the ivory market. However, it is a difficult decision. The demand for ivory is likely to remain and ivory legally and humanely taken from domesticated elephants may satisfy most of this requirement, preventing poaching of wild elephants. The market might be better monitored and regulated if its trade stays legal for now. Security and law enforcement should focus their efforts on the illegal ivory market, particularly the online market, which is harder to regulate. Gradual rehabilitation for 3rd or 4th generation of domesticated elephants into a semi-wild habitat may be considered, where there is a small population of wild elephants. This could replenish variation in the genetic pool and reduce the risk of wild elephants dying out. Over 70% of the natural forest in Thailand has been destroyed in the last 100 years. This, combined with the reliance of most remaining elephants on human care, means that they cannot safely be released into ‘the wild’. In any case, Thailand is not Africa and additional, suitable, available land in National Parks no longer exists. Increased awareness about elephant welfare means the role of elephants in Thailand is ever-changing. It is up to us to work with Thai people, to make this a positive change for elephants, while preserving their place in Thai culture. It is clear that Thai people love and worship elephants. Often, poor treatment stems from a lack of education, or a lack of funding to provide appropriate care. Many ecotourism centres benefit from volunteer work. This allows businesses with limited funding to provide the best animal care they can, while educating volunteers from around the world. Email info@southernthailandelephants.org to find out more. Holly Collicott completed her degree in Natural Sciences at the University of Birmingham in 2017, majoring in Biology and Psychology. She has always had a deep interest in animal behaviour, especially in group-living species, and how complex behaviours develop in these animals with cognitive abilities. As a student, Holly worked as a volunteer at a monkey sanctuary in UK and found it very rewarding designing environmental enrichment for the animals, although her sadness at the primate pet trade made her resolve to ensure animals are properly cared for in accordance with their needs. She has also worked for the Royal Society for the Protection of Birds at the Loch Lomond Reserve in Scotland surveying bird-life and plant-life and monitoring activity. Holly is 23 and says she wants to apply her degree to the real world. She shares our determination that the Asian elephant must be protected and their habitat conserved. Holly recognises the importance of education and making the public feel connected with animals, and really enjoys explaining science to non-scientists. As a creative person, Holly loves arts and crafts, as well as cooking and swimming. 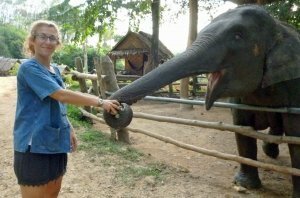 Holly was a Volunteer at Phang Nga Elephant Park from October 2018 to February 2019.